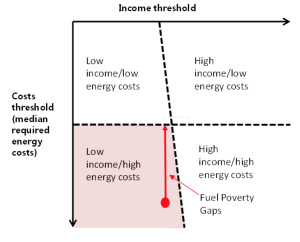 We blogged recently about the new Fuel Poverty Strategy Consultation. Now you can have your say! NEA are running a series of six free seminars during September and October, to give people a chance to hear from DECC about thinking on fuel poverty, to share best practice and to contribute to the development of the strategy. There’s more information and a booking form at http://www.nea.org.uk/campaigns-events/fp-strategy-seminars. The London seminar will be held on the morning of Thursday 4 September. If you can’t make that, then there will be a session in Peterborough on 11 September (other sessions are a bit further afield but are listed on the website). This sounds like a great opportunity to get under the skin of the Fuel Poverty Strategy consultation and make sure your voice – and the voices of those you represent – are heard in this important policy area. The Government’s Fuel Poverty Strategy is due out for consultation very shortly. As part of the discussion at the Carbon Action Network Training Day in Manchester recently, local authorities, housing providers, energy advisors and others discussed the potential impact of the new strategy, based on the approach laid out in DECC’s Framework for Future Action on Fuel Poverty. You can read a full write-up of discussions here. There are some great examples of data sharing, wider engagement (eg, with CCGs), partnerships and outreach, but it’s still hard for organisations to find out what others are doing and to translate that work into their own organisation. Many of the discussion points from the Manchester Conference apply equally to local authorities, housing providers and others in London. We’d be keen to hear from you about how your organisation will be responding, particularly to the change in definition and how you might target fuel poverty activities differently in future. Get in touch: @LDNFuelPoverty or londonfuelpovertyhub@se-2.co.uk. Established by the UK Health Forum, the Healthy Places website focuses on factors affecting public health that are new, interesting or often not fully understood or recognised. It provides a wealth of useful information and resources for health professionals, health and wellbeing boards and local authorities, and explains the operation of laws and potential policies that could enable or place limits on local government and community activity and affect the health of a community. Up-to-date links to information on Government programmes such as ECO, the Winter Fuel Payment Scheme and the Warm Homes Discount. The toolkit also has a range of other useful links, including to resources for vulnerable individuals, energy efficiency information, and home improvement, energy savings and income maximization support. Why not take a look? The UK Health Forum is an alliance of organisations, public health professionals and academics working to reduce the risk of avoidable, non-communicable disease at a local, national, regional and international level. You can find more information about their work here. Join them in London for an evening of debate and a chance to have your voice heard by MPs from all 3 main political parties.